Like most plants, grass comes in a variety of shapes, sizes and colors, and each one has a growth style all its own. Not all grasses do well in shade and some that thrive in shaded areas don’t do well in bright sun. Some grasses do best in cooler months, while others do best in warm months. Shade-friendly grasses are used to fill in areas were sun-intolerant grasses tend to leave bare spots in the lawn. This type is strictly a warm weather tropical grass, requiring either full sun or some shade, but never total shade. According to the University of Florida's Institute of Food and Agriculture Extension, the most shade-tolerant cultivars of this variety are 'Seville', 'Delmar', 'Floraverde' and 'Captiva', which can get by on five to six hours of sunlight per day.This grass doesn’t do well in cold weather so it should not be planted in Northern climates, but does well in warm regions. 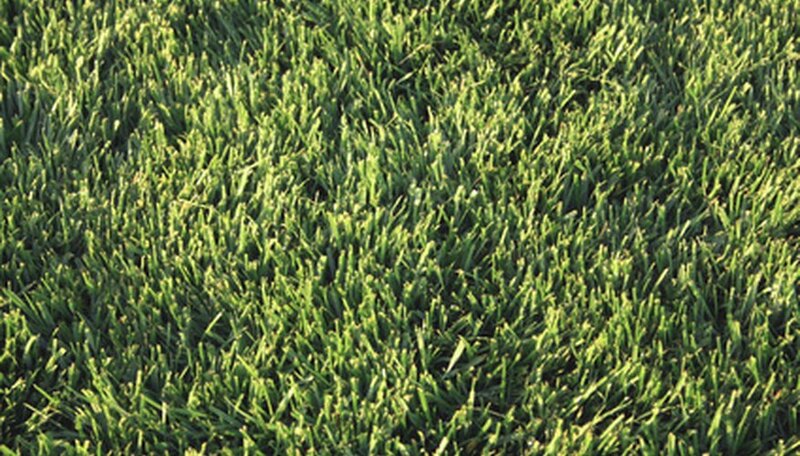 St. Augustine grass is wide-bladed and coarse in texture, with a deep green color. Seeds are difficult to obtain and even more difficult to grow successfully, according to American Lawn.com. This type of grass does well when plugs of the grass are taken from one lawn and planted in another or if entire mats of sod are dug up and introduced to the new lawn. Zoysia matrella, commonly called Manila grass as it originated in the Philippines, is found in tropical and sub-tropical climates. It is a fine-textured, dense growing grass that has a low cold tolerance and should not be planted in Northern climates. According to Tip Top Turf, this grass has good-to-excellent shade tolerance and grows in any type of soil, is resistant to many insects and diseases, and can be closely cut. What Kind of Grass Will Grow Without Sun? At What Temperature Does Zoysia Grass Turn Brown? Which Grass Seed Is to Grow Dark Green Grass? How Tall Does Grass Grow Before Folding Over? What Grass Will Grow Anywhere?